Waterproof or WPC (wood plastic composite) and SPC (stone plastic composite) flooring is an excellent flooring choice for Orange County property owners who are interested in getting an attractive, long-lasting, and highly functional floor at a great price. Waterproof flooring consists of multiple layers of vinyl and composite materials to resist moisture and endure years of foot traffic and general wear and tear. Waterproof floors often feature designs that closely resemble the look of authentic hardwood, tile, or stone flooring, right down to the surface wood grain or stone striations, yet costs much less. Additionally, waterproof floors are quick to install, and easy to maintain. Common liquid spills and other messy materials are easily wiped clean without leaving stains or residual moisture. WPC flooring is suitable for any room in your home or commercial property, including but not limited to kitchens, bathrooms, basements, and living rooms. 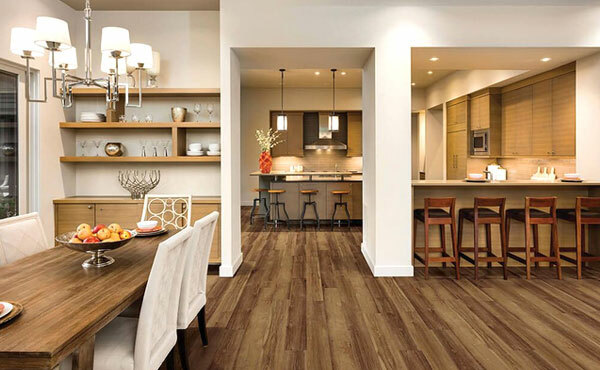 If you are interested in learning more about our waterproof vinyl flooring, or want to talk to one of our flooring experts about the best flooring options for your needs, call or visit us today. We have WPC flooring options in a large variety of patterns, colors, and surface textures, and also offer some waterproof flooring systems that come with a pre-attached underlayment for faster and less expensive installation. Additionally, some brands come free of PVC, formaldehyde, phthalates, and plasticizers.